The snowboarding industry is on fire, as evidenced by these two newcomers proving it with their own spin. The best perk from having your very own snowboard factory? You get to play. The folks at Signal Snowboards, which will manufacture approximately 7,000 boards out of its Huntington Beach, Calif., location this year, have made playing part of their business plan. It's a hot afternoon in July, and Signal founder and CEO Dave Lee and his team are testing a paintball gun on a mannequin. The plan is to mount the gun to a board for an epic snowboard-paintball battle scheduled the following week on Mount Hood in Oregon. The entire process, along with battle day, is being filmed for the second season of "Every Third Thursday," an online video series that Lee started last year to "build freak boards with random materials" and explore the creative boundaries of snowboard construction. The crew has created themed boards using Legos, Vans sneakers materials, vinyl records, recyclables--and even hard-wired a karaoke machine to a board before hopping on a plane to Japan. You won't see these boards in the store, but Lee says "Every Third Thursday" ideas all have potential production points, and the industrial focus differentiates Signal from the competition. "We're making something fun, but we try things because we want to put them into production boards, whether it's looking at new shapes or how materials work with one another," he says. "People are interested in the behind-the-scenes making of a snowboard, and we've helped make the factory cool again." Lee's background helps. A former pro snowboarder for the popular Lib Tech brand, and an employee at a snowboard factory before that, Lee grew up working on the decks of pro riders, and was able to try out all the newest ones himself. He founded Signal in 2004, and in 2007, merged with Five Axis Manufacturing. Inventory has sold out the last three years (boards are priced from $370 to $460), and there are now 16 full-time employees. As the company climbs up on $2 million in sales, it's expanding into outerwear. Production growth is steady--the goal is to move between 15,000 and 20,000 boards a year--and so is the introduction of new ideas. "We still have time to be creative," Lee says. "We're at a size where mistakes can cost a lot, but you can't worry about how things are going to work all the time. You have to push forward all the time to get to the next level." 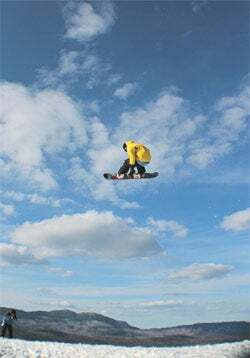 Looks matter in snowboarding, which is why all companies struggle to come up with designs that appeal to the broadest cross-section of consumers. All, that is, except Portland, Maine's Team Eight Snowboards. Founder Greg Johnston was 22 when he started developing the technology to make it possible to manufacture customized snowboards economically. Six years later, in 2009, he quit his job as a software engineer and launched Team Eight. "The first year I did it just to see if I was the only person who wanted a custom board," Johnston says. Turns out, he wasn't. His "Configur8or" is a web application that lets people design their own snowboards. The software automates the cutting and aligning of all the pieces of the board, and Johnston programmed a press (the machine that compresses those pieces into a snowboard) to automatically move and adjust based on custom specs. Johnston admits the business is experimental, but sales of the boards--which run from $375 to $600--tripled the second year. He's also toying with the idea of creating a stock product line for next season to guarantee some base-line sales. Johnston, who self-funded Team Eight, is also the only full-time employee. "I want to see how the public will react before running to VCs and asking for millions of dollars," he says. "I thought I'd try something I love before sitting in front of a desk."